Office Space - Grantham, Lincolnshire. Spread across a total space of approx. 4,000 sq. 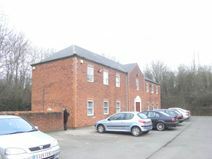 ft. and two floors this detached office building consists of a ground floor with a reception area and three large offices and two further partitioned offices and on the first floor another five offices, a fitted kitchen and a central meeting area. Nearby Grantham Railway Station provides connections to London Kings Cross, as well as north to Newcastle and Edinburgh Waverley.